During the past weeks, I have been trying to do tempo runs and was hoping to break a sub-60 on my 10k runs. I was glad to have been on that horizon and hopefully I get to improve each week. I believe that my training for BDM 102K has earned me enough mileage in improving my endurance. I am now beginning to put in some tempo runs and speedwork in my regimen in order to improve my speed. In the past, I have focused on endurance building and totally forgot about temp run and speedwork. Probably one of the reason was to avoid any risk of injury as I have been on the sideline for a long time in 2009 which caused me to lose running mileage. Good thing I have cycling as my cross training. It's time that I get out of my comfort zone and push myself a little bit and increase my training level up one notch. It is still a long way to go to improve my performance and the only way to go is to continue training. I still need to achieve two running goals this year, a sub 2-hr half marathon, and a sub 4:45 full marathon. Let's see how I progress. 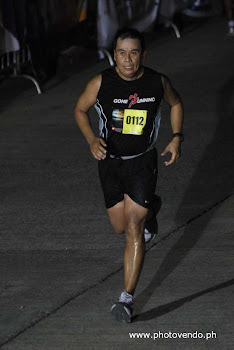 After my 70.3 Half Ironman stint here in the Philippines in August last year, I have not put in swimming (and cycling) in my training plan as I focused more on building my running mileage. As a result, I completely lost the proper form and need to get back to the basics. A lot of mistakes in my swim, my arm stroke was not syncrhonized, my kick was wide, had difficulty in breathing technique, and I was not swimming in a straight line. Everything was a complete disaster and I knew I needed to refresh and get back to do more drills. I began to get back on the saddle last month. Started off with an hour of spinning on the trainer to get the feel of it before doing my road rides. Then I gradually started to build mileage on the road and had a two 80km ride during the Holy Week. I have now included cycling in my training regimen, 2 weekday rides, and 1 weekend long ride. Probably I would insert a brick session (bike-run) in one of my weekday rides. This is how my training plan would look like this week. I hope I can keep up with it (Mon-Wed is done).